What are bitewing x-rays and how often should they be taken? Let’s start with the bottom line: Radiographic (x-ray) imaging is an integral tool in the assessment and diagnosis of dental caries (tooth decay) and periodontal (gum) disease. Evidence-based research clearly shows that used judiciously, bitewing x-ray imaging is the method of choice for determining the presence and extent of decay in the areas where back teeth touch each other and in assessing any bone loss. The earlier dental caries is detected, the easier it is to reverse or treat. When incipient or very early caries is confined to outer layers of tooth enamel, the accompanying mineral loss, known as de-mineralization, can be reversed (re-mineralized) with the application of preventive agents, particularly fluoride. These very early lesions (evidence of disease), however, can also be the hardest to detect. Generally, the diagnosis of tooth decay is made by visual examination or by trans-illumination — shining a very bright light through visually accessible tooth surfaces to identify changes directly. But this is not possible on the contacting surfaces of the back teeth, hence the advent of the bitewing x-ray technique. A series of 4 bitewing radiographs is taken periodically to evaluate teeth for decay. The higher your susceptibility to tooth decay (and the more fillings you have), the more frequently you are likely to need them. The name derives from the small tabs upon which a patient bites to hold the x-ray film or sensor in place. Bitewing radiographs are among the easiest and most accurate to take, giving distortion-free results necessary for the accurate assessment and diagnosis of dental decay between the teeth. In children and adolescents, they also show developing permanent teeth. Taken with the film or sensor place in a vertical direction (vertical bitewings), these radiographs also show bone volume and density, for evaluation of periodontal health (“peri” – around; “odont” – tooth). Bitewing images usually consist of four films, two on each side, which are necessary to capture all the back teeth — premolars and molars. Often only one bitewing image per side is required in smaller children. Bitewing x-rays carry little risk for you and your children when appropriate precautions are taken. Body parts other than the teeth being examined are carefully safeguarded: Lead collars and aprons are worn to protect and shield the neck and the rest of the body. The x-ray machine’s beam is collimated (produced in a narrow column) — designed to minimize the area of exposure, keeping it focused on the teeth. The use of today’s high-speed film and digital sensor technology has significantly reduced radiation exposure, while increasing accuracy. Acquiring clinically justified radiographs always involves consideration of the risks versus the benefits of radiation exposure. The ALARA principle (As Low As Reasonably Achievable) always serves as a guideline: Taking as few radiographs as diagnostically necessary and only when needed; selecting imaging techniques that result in as little radiation exposure as possible; adhering to precise technique; and avoiding retakes, all result in bitewing images of high diagnostic accuracy with minimal x-ray exposure. The frequency with which bitewing x-rays should be taken is not one-size-fits-all; it is a clinical decision that should be made by you and your dentist after evaluating the risks, benefits and alternatives. It will dependent upon a number of factors including: age, which in the case of children and adolescents will reflect the stage and state of development of the teeth; and the risk of tooth decay, in itself part of a number of other clinical factors. From a periodontal standpoint, it will also include periodic monitoring and evaluation of bone levels in the assessment of periodontal health. 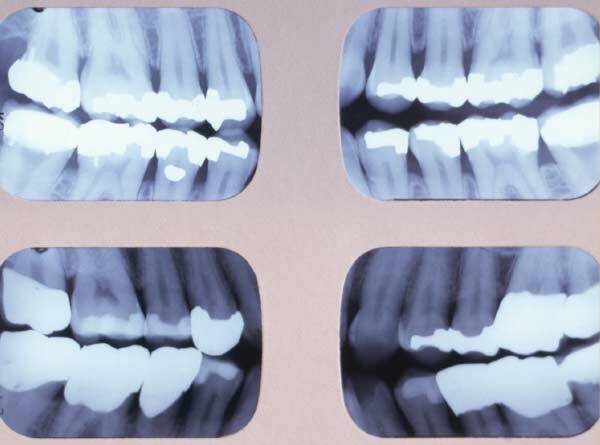 It is not uncommon practice to have bitewing radiographs taken as often as every six to twelve months during childhood or adolescent development, or for adults with high decay rates. The alternative is that tooth decay can go undetected and progress rapidly, requiring extensive repair or even tooth loss. And that will warrant more x-ray exposure (beyond bitewings) necessary to facilitate even more extensive assessment and diagnosis necessary for tooth replacement. 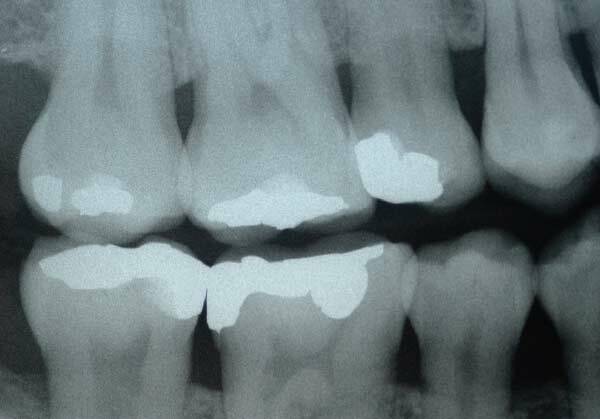 Longer intervals between bitewing x-ray examinations are indicated when the risk of caries (tooth decay) and periodontal disease is low. X-rays are electro-magnetic waves, a type of radiation beyond the visible spectrum that can penetrate living tissue. In the case of the mouth, they can pass through soft tissues like cheeks and gum tissue, but less readily through harder tissues like bone and teeth. Just as photographic film captures light to make pictures, so radiographic film (or a digital sensor) records x-ray images, only in black, white, or shades of grey. Thus the densest and most impervious structure to x-rays, tooth enamel, will appear white on a radiograph. The body of the tooth, composed of a softer, bonelike substance called dentin, will appear less white, and pulp, the soft living tissue within the tooth, will appear grayish black. Dental caries (tooth decay), which dissolves minerals from the tooth’s surface, makes enamel less dense and more permeable to x-rays, so that it appears darker than normal tooth structure. Once the decay has penetrated the enamel into the dentin, it will progress much more rapidly due to the more porous, less dense structure of the dentin. That’s why early detection is so important.